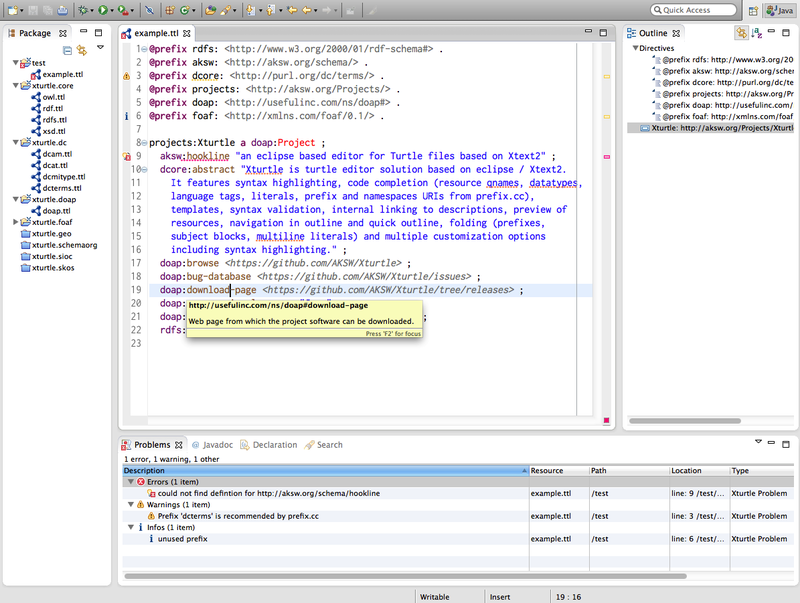 Xturtle is turtle editor solution based on eclipse / Xtext2. It features syntax highlighting, code completion (resource qnames, datatypes, language tags, literals, prefixe and namespaces URIs from prefix.cc), templates, syntax validation, internal linking to descriptions, preview of resources, navigation in outline and quick outline, folding (prefixes, subject blocks, multiline literals) and multiple customization options including syntax highlighting. During the installation, you will get a warning that the package is unsigned. For more information on features, usage notes and technical background, have a look at the wiki. We are happy to announce the first public version of our Turtle editor Xturtle. Read more about "Xturtle: Turtle editing the Eclipse-way"